Type 90JG. Drive links 34. STANDARD EQUIPMENT: 8" bar and chain with auto oiler. 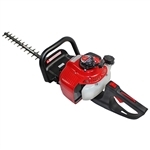 SPECIFICATIONS: .080" diameter cutting line, dual exit, 8"bar length. 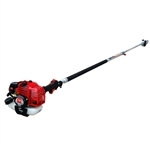 Attachment capable, SureFire 25cc 2-cycle engine, EPS Effortless Pulling System. 25cc 2 cycle clutched engine with spring assist starting. 10? cutting bar. Split boom straight shaft. 12 foot reach. Contoured padded handle.